ISO DIN radio provision with pocket. ISO DDIN radio provision. Painted charcoal black and gray to match factory finish. Antenna Adapter. Painted black to match factory finish. • Warranty service will be refused if serial number of unit does not match that of serial number sold by us. We are committed to providing you a quality product at the lowest prices possible. For both DIN and DDIN Painted Silver Also available in Black 99-5821B Red 99-5821R Blue 99-5821BL . Painted a scratch resistant matte black to match factory dash Double DIN radio provision Also available in Black 99-5821B Blue 99-5821BL Red 99-5821R Silver 99-5821S . (Fiesta 2011-UP. A) Radio Housing. Kit features. Kit components. Painted Matte Black to match factory finish. Wiring and Antenna Connections. Tundra 2007-up. Painted a gloss charcoal gray to match OEM finish. 99-8220CHG= Charcoal High Gloss. Painted a gloss charcoal gray to matchOEM finish. 99-8220HG= High Gloss. Wire harness We are committed to providing you a quality product at the lowest prices possible. 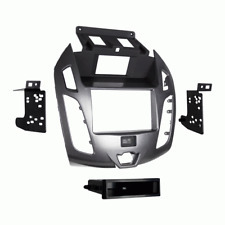 Designed specifically for the installation of double DIN radios or two single DIN radios High grade ABS plastic contoured and textured to compliment factory dash All necessary hardware to install an aftermarket radio Comprehensive instruction manual Painted to match black OEM color and finish . 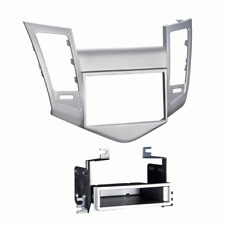 Double DIN radio provision Painted silver to match factory dash Note: Will not match brushed aluminum models. Applications Maxima 2004-2006 Wiring and Antenna Connections (sold separately) Wiring Harness: 70-7550 Antenna Adapter: 40-NI11 . LINCOLN Town Car. Contoured to match factory dash. • We strongly encourage professional installation of any electronic devices. 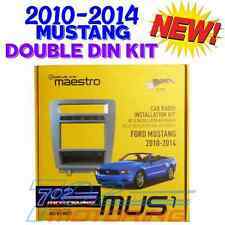 70-5521 – Ford amplified harness 2003-up. Double DIN radio provision ISO stacked radio provision . Provides pocket with recessed mounting of a DIN radio or an ISO DIN radio using Metra patented ISO quick-release brackets . Focus 2005- up. Focus C-Max 2005- up. DIN Head unit provisions with pocket. ISO DIN Head unit provision with pocket. DDIN Head unit provision. Painted Matte Black to Match Factory. • Warranty service will be refused if serial number of unit does not match that of serial number sold by us. ISO DIN radio provision Double DIN radio provision Applications for Nissan Rogue S (special edition package) 2012-2013 for Nissan Rogue SV 2012-2013 for Nissan Rogue Select (with upper model radio) 2014-up Wiring and Antenna Connections (Sold Separately) 70-7552 harness 40-NI12 antenna adapter .